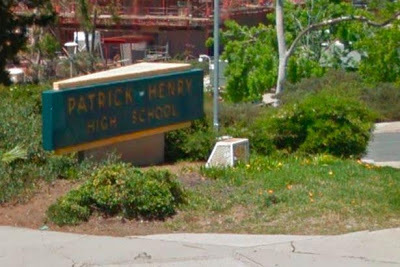 A 19-year-old girl has been awarded £1 million by a jury in compensation for being forced to urinate in a bucket while she was a student at Patrick Henry High School in San Diego, California. The girl who was 14-years-old at the time of the incident had requested for permission from her teacher to use the bathroom, however, the teacher, Gonja Wolf, who thought the school had a strict 'no bathroom breaks during class' policy told her she could not go and suggested she use a bucket in the supply room. The pupil reportedly took the option of urinating in the bucket and flushing it down a sink. This she claims led to her being humiliated and bullied in school to the point that she became depressed and attempted suicide. She sued the school after it rejected a claim for £20,000. The school's district attorney, Katheryn Martin, told the court that the teacher had not intended to humiliate the pupil and referred to Ms Wolf's suggestion to the girl as a "lapse of judgment which she thought was a good idea". The pupil was awarded £1 million in compensation plus £32,500 to cover medical expenses. The school was not satisfied with the decision reached by the jury and are considering appealing the judgement, as revealed by a spokesperson for the school district.